On Tuesday, Ukraine celebrated its new holiday, the Day of Dignity and Freedom. This is the fourth anniversary of the beginning of EuroMaidan, the one that led to a bloody coup and a civil war. If we evaluate the results of the new government, they’re simply disastrous for the country. In the year before the coup, the GDP was estimated at $180 billion, in 2017 it’s expected to be half as much, $90 billion. The average salary in the country was more than halved, from $408 per month to $196 last year. The exchange rate of the hryvna fell three and a half times, from 8 to 27 per dollar. As the main high-tech enterprises are destroyed, the economy acquired a colonial structure. More and more raw materials are exported, they’re nearly 80% of the export. Half of this is agrarian. The export total volume fell by 57%. Foreign direct investment fell by at least four times, from 6 billion a year to one and a half. That’s practically nothing. And out of this nothing, however, most of the investment still comes from Russia. The national debt has been increasing all the time and has now become difficult to be paid back. It was 64 billion dollars which then became 80 billion. Many millions of its citizens left the country in search of a better life. Some of them went to the West, some to Russia. The health system and the education system deteriorated. The system of legal proceedings as well. Corporate raiding became the norm. Corruption increased. The country broke into pieces. Poroshenko and his team deceived everyone: the West, and Russia, and their people in terms of the country's prospects, the practice of the new government, and the Minsk Agreements. This week, a military offensive was launched in Donbass, and two small settlements in the gray zone, that is, on the demarcation line, were occupied. The soldier: "We can see the consequences of the fact that the armed forces of Ukraine occupied the village of Gladosovo. From there, they’re now firing at the residential quarters of Gorlovka". They don’t even hide the fact that they were ready to go farther if they hadn’t been stopped. The story of the so-called Heavenly Hundred, those shot on Maidan, is a complete lie. They’re trying to blame the case on the Ukrainian Berkut police. A trial is supposedly underway. Journalists, meanwhile, are conducting their own investigation. And the mysterious snipers were found and even started talking. A documentary shown recently in Italy on the TG-5 TV channel exposes this. Anna Afanasyeva will tell us more about the sensational investigation. Almost four years have passed since the shooting on Maidan. In those bloody February days, more than 80 people became victims of a sniper attack. The Prosecutor General's Office of Ukraine found the guilty ones, the Berkut police. Both back then and today, there are those who insist on an international investigation into the deaths of people, and the question of who was shooting on the Maidan is left unanswered. Alexander Revazishvili, Maidan participant: "We had an assignment to shoot both the Berkut police and the protesters, which shocked me". Koba Nergadze, Maidan participant: "We had to provoke chaos to make people fight against the Berkut". Sensational confessions of Georgian contractors, who were in the Ukraine Hotel and the Conservatory building at the time of the shooting, were published on November 15 by the Italian Mediaset channel. Until now, Europe has refused to listen to such versions of the story. Koba Nergadze: "I’m a soldier, I can’t disobey the order". Zalogi Kvaratskhelia, Maidan participant: "We were paid a thousand dollars, and promised another 5 thousand later". The author of the movie "Ukraine. The Hidden Truths" is an Italian journalist by the name of Jean Mikalesin. The events of 2014 have always been part of his professional interest. Jean Mikalesin, author of "Ukraine. The Hidden Truths": "The main version in Italy, as well as all over the world, is that the government fired at the demonstrators. The words of the Georgian killers radically changes the picture of what really happened". Koba Nergadze, Maidan participant: "If three years ago someone had learned of these details, everything would have been very bad for me. I still don’t know what will happen to me if I return to Georgia". They went to Maidan on Mikhail Saakashvili’s personal order. Their actions were coordinated by Mamuka Mamulashvili, one of the Georgian Legion’s future leaders, which is fighting in Donbass together with the Ukrainian Armed Forces. Alexander Revazishvili, Maidan participant: "Mamuka asked me if I really served as a sniper. I told him that I did. I wasn’t a professional, but I had good results and I shot well, so they wrote down that I could shoot well". Tristan Tsitelashvili, Georgian Army General: "We have facts, names and surnames, we know who these snipers are, where these snipers came from, who commanded them. Snipers were in the Ukraine Hotel, on the third floor, from where peaceful demonstrators were shot". Retired General Tristan Tsitelashvili made this announcement right after the February 2014 shootings. Back then, he was just released from prison, where he spent 4.5 years as a political prisoner of the Saakashvili’s regime. Tristan Tsitelashvili: "Mobilization was announced. The soldiers were mobilized in the grouping zone. 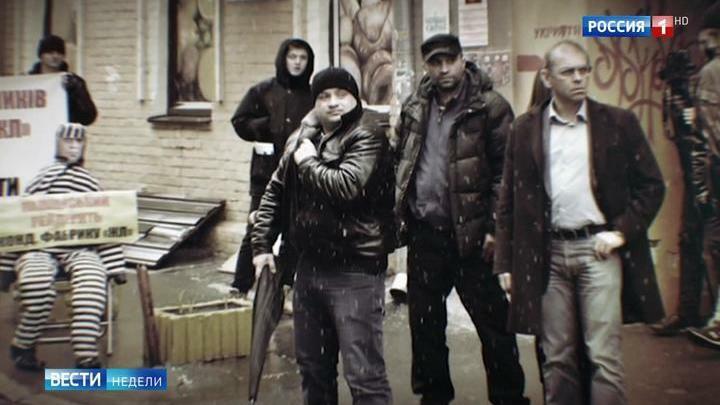 These were the contractors who were sent to Maidan in 2013-2014. They went there as volunteers to overthrow the regime in Ukraine". Alexander Revazishvili arrived in Kiev in January 2014. Alexander Revazishvili: "Here we are in our tent on Maidan. Here I am". Koba Nergadze and Zalogi Kvaratskheli flew to Kiev in December 2013. All three came with false documents. Koba Nergadze: "We were met by Andrei Parubiy. Only later did we get to know who he was. He talked with Mamulashvili, they discussed something, exchanged something and went away. I had the fake name, "Georgy Karusanidze" in my passport". Here is the man who welcomed them, Andrew Parubiy. In the video, shot right in December 2013, the future Verkhovna Rada chairman, back then a Maidan commandant, defended the protesters with his own life. According to Revazishvili, they were given clear instructions for further work on Maidan. Act as aggressively as possible. We had only this main task. We had to provoke Berkut so that it would go against the people. Next, the Georgian contractors were introduced to an American military instructor. Koba Nergadze, Maidan participant: "On the 15 and 16 of February, the situation was getting worse. High-ranking opposition members were coming to the Ukraine Hotel. Parubiy would come very often. Pashinsky would come, too. They came with Misha and brought Brian". Brian Christopher Boyenger is a military instructor, a former sniper in the US 101st Airborne Division. After Maidan, he will also go to Donbass, where he’ll fight in the Georgian Legion ranks. Brian Boyenger: "There's always been a long tradition of American volunteers taking part in in the settlement of conflicts in other countries". At the Ministry of Internal Affairs of Ukraine, they, of course, also knew by that time about foreign contractors who were invited for the purpose of provocation. Vitaliy Zakharchenko, Minister of Internal Affairs of Ukraine in 2011 — 2014: "There were representatives of the Baltic states and the USA, representatives of the radical groups of Belarus, there were Poles". The former Minister of Internal Affairs of Ukraine, Vitaliy Zakharchenko, said that the presence of Georgian snipers on Maidan was predictable. Vitaliy Zakharchenko: "The Georgian trace isn’t coming from 2013-2014 but from the election. And the so-called Orange Revolution, the presidential election, and the Orange Revolution of 2004-2005 showed that the Georgians were already present, they were invited and they came even to Donbass, where they tried to organize riots". In the Svyatoshinsky court of Kiev, Sergei Zinchenko and Pavel Abroskin are in the dock. Sergei Zinchenko: "If I killed someone or Pavel did… If we killed someone, we’ll answer for that. And if we didn’t, then why did you have to arrange all this?" 26-year-old fighters of the Berkut special unit are being accused of involvement in the shooting of 39 people on Institutskaya street in February 2014. Yevgeniya Abroskina, Pavel Abroskin's sister: "Everyone understands that first they invented the sentence and then they began to look for guilty parties". The elder sisters of the suspected Berkut members Yevgeniya Abroskina and Natalia Zinchenko came to Kiev Maidan for the first time after the tragic events. Natalya Zinchenko, Sergei Zinchenko's sister: "Human life can’t be given back, never and there’s no way. It's simply insulting that the victims don’t even want to fight for the truth. I want to tell them, "Look, your son, brother, husband was killed, and do you think how many times they turned over in the coffin because of what is happening in Ukraine now?" Yevgeniya Abroskina says that the main evidence of the investigation are these photos on which the features of the sniper are hardly possible to be distinguished. Yevgeniya Abroskina: "As I understand, there should be the body, the bullets, the weapon, and the man who shot. They only have the body. There’s no more evidence as such. It’s not going conclusive at all". Valentina Zinchenko, Sergei Zinchenko's mother: "You are in Sergei Zinchenko’s room, he served in the airborne forces in Zhitomir. Here is his jacket, here is his certificate, which confirms that he served honestly and conscientiously". Part of the evidence of Sergei Zinchenko's guilt, in the opinion of the investigation, is that he is left-handed. Allegedly, there are shots in the video from the scene on which the Berkut fighter shot with his left hand. True, he writes with his left hand, but he does everything else with his right one. Natalya Zinchenko: "Here are the photos of him taken during the service in the 10th unit. But he couldn’t come to Maidan and switch hands". Alexander Goroshinsky, attorney: "Up to date, there’s no data that would indicate that a departmental weapon was used and that it belonged to a specific person and someone was killed by them, no one has been identified as the person who opened fire". Over the years, no Maidan supporter was detained during the investigation of the Heavenly Hundred case, despite official data about 39 police officers who were mortally wounded on February 20. The attorney: "Pashinsky and Parubiy, Yatseniuk and Klitschko, Poroshenko and Lutsenko, all of them are witnesses among others. And the defense very much hopes that these people will come and testify in court". Let’s go back to the Georgian contractors. On February 20, Zalogi Kvaratskhelia was in the Ukraine Hotel. Zalogi Kvaratskhelia, Maidan participant: "As for the weapons, when they were brought in, there were two more Lithuanians, and they took over this business. I didn’t take the weapons because I already knew what the consequences would be. Then, I heard shots from the next room. Then, the Lithuanians opened the window. One of them shot, the other closed the window. They probably fired 3-4 bullets". Alexander Revazishvili belonged to another group that was in the Conservatory building. He received information about the Berkut movements from the new curator, Sergei Pashinsky, one of the Maidan leaders. Alexander Revazishvili: "Pashinsky approached us and asked me whether it was possible to fire from the point where we were, whether it was a fine spot to fire at Berkut. Because Berkut was on the opposite side. We saw it". According to Alexander's recollections, weapons were brought to the Conservatory by the same Pashinsky. And he’ll also be the one to give the order to shoot on both factions on the barricades. Alexander Revazishvili: "Pashinsky had an automatic rifle, a Kalashnikov with an unfold stock. There was a guy near him, and I found out later that it was Parasyuk. The younger had a Saiga-12. The elder had an SKS". Vladimir Parasyuk, whom Alexander recognized, is one of the Maidan leaders. It was he who put an ultimatum to Yanukovich who from the stage. Alexander Revazishvili: "If at 10 o’clock tomorrow Yanukovych doesn’t resign, we are going to storm the building with weapons. I swear to you! The day before, on February 20, Parasyuk was seen not only in the Conservatory but also in the lobby of the Ukraine Hotel. On this video, he coordinates the actions of the fighters, who will very soon take the position in the room on one of the last floors". As it turned out later, the shooter in the gray hat, who wasn’t afraid to get caught by the camera, was Maxim Krivonos. Now he is free, and on the web, there’s a photo of him with Gennady Moskal, Chairman of the Parliamentary Commission for the investigation of murders during Maidan. All the Maidan leaders, mentioned in the interviews of Alexander, Zalogi, and Koba, became major functionaries in the new government’s hierarchy. They’re creating their own story of the Heavenly Hundred shooting, in which there isn’t a word about visitors from Georgia and Lithuania, who have extensive experience in dealing with firearms. Anna Afanasyeva reporting especially for Vesti Week of the Week.